I make a strong case in my dissertation that this was actually a tattoo that Tonti himself wore because of the flirtatious way in which he writes about it (the description of the tattoo is in a letter to a lady friend) and Tonti’s own history with body modification including probable tattoos. One can’t help but wonder: Did this tattoo become a standard tattoo through oral tradition among sailors, traders, military men, and the like? Or perhaps–and this is my favorite hypothesis–the man pictured in Lombroso’s illustration was a bibliophile with a rare book collection and had read Tonti’s account (which, of course, goes against all that Lombroso, Lacassagne, and fellow scholars were trying to assert re: tattooed people–that they were atavistic, more primitive, less intelligent, degenerate, childlike, etc.). However…the distrustful scholar in me wonders if this illustration even actually references a real body. I would not put it past Lombroso, who clearly hated to have to acknowledge that non-criminals got tattooed (in his 1896 Popular Science article he called the British women who were getting tattooed as part of the artistocratic-driven fashion at the time inferior, vain, savage, and atavistic) to have just crafted a heavily tattooed body from bits and scraps of tattoos that he had read about in other texts or heard about at academic lectures. This might be why the motto tattooed across the chest differs from the one in Lacassagne–even though Lombroso’s image predates Lacassagne’s by a few years, if he had heard Lacassagne speak about the tattoo at an academic gathering, he could have flubbed the transcription (note the missing word in the middle line! ), perhaps never even viewing or interviewing the man in question, which would make the popular outcome of the influence of his flawed scholarship even more depressing. 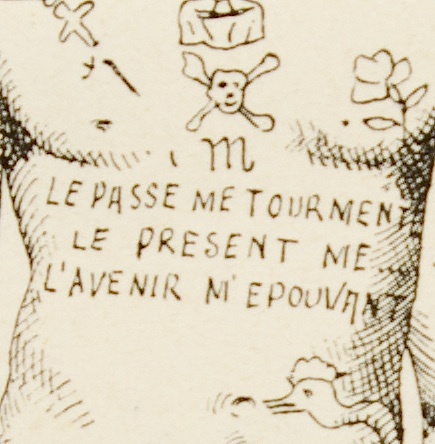 When you look at how carefully Lacassagne rendered the script (especially in contrast to some of the other text tattoos for which he meticulously tried to replicate the font), it seems even more of a possibility that Lombroso may not have seen the tattoo (or at least didn’t sketch it very carefully). Questions, questions…more research to be done.